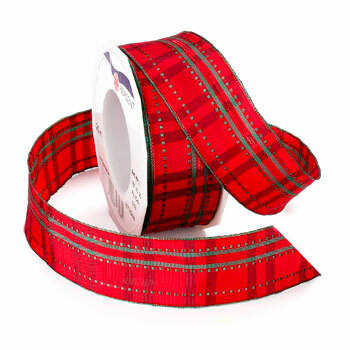 Nottingham is a modern plaid patterned ribbon. This gorgeous style has metallic thread sewn into it to give a fabulous shimmer. It is also wired to hold a magnificent bow, perfect for your Christmas crafts. This style is available in several different widths.